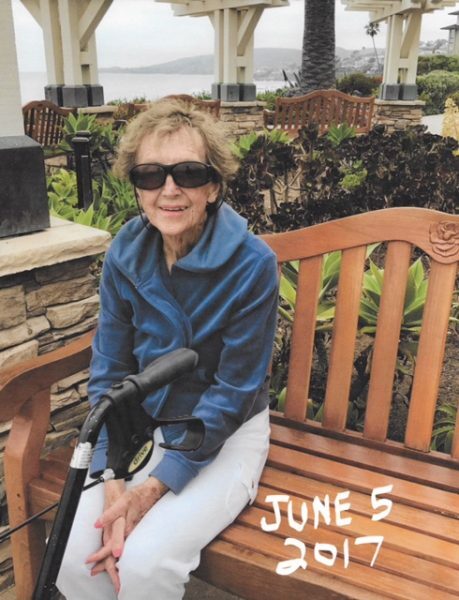 Helen Pines, of Laguna Beach, passed peacefully in her sleep on July 29, 2017. She grew up in Los Angeles and attended the University of Southern California. She began her career as an interior decorator and ended it as a loving mother and homemaker. Her husband, Mark Pines, predeceased her in 2004. Together, they were pioneers in the city of Laguna Beach, building a home there in 1958. Pines spearheaded the procurement of the land to be used for what is now known as Crescent Bay Park in Laguna Beach. Helen and Mark Pines were especially active in the loving community at Laguna Presbyterian Church. They both were dedicated to serving the Lord. The couple had two children, Paul and Tim. Pines is survived by Paul, eight grandchildren, and 13 great grandchildren. A celebration of Pine’s life will be held at Laguna Presbyterian Church, 415 Forest Ave., on Friday, Aug. 4, at 2 p.m.
Pines loved the Lord dearly. Another great love was books. She was a regular visitor to the Laguna Beach Library almost up to the time she went to the Lord. In lieu of flowers, the family has requested donations be considered to Cup of Cold Water Ministries, Box 318, Newark, Ill., 60541, or to Reach Out and Read, San Diego, P.O. Box 22212, San Diego, Ca. 92192, both on behalf of Helen Pines.